I’ve drenched tofu and soy curls in sriracha and Earth Balance before, and decided I’d try it again this past week but with chickpeas instead. So they went straight into a crockpot to baste in some buffalo sauce and a few other ingredients for a few hours, while I mashed together fresh avocado with some vegan sour cream to serve on the side. This tasted fantastic right out of the crockpot inside a soft tortilla, but was even better the next day served as leftovers, once all of the filling ingredients had a chance to mingle just a bit more. Place all of the filling ingredients into a crockpot. Place on the low heat setting for about 3 hours, then increase the heat to high for one more hour. Mash the avocado until smooth, then stir in the vegan sour cream, vinegar and salt. Refrigerate until ready to use. Place a bamboo steamer into a large skillet. Add a few inches of water into the bottom (make sure it isn’t touching the bottom of the steamer basket. Place tortillas into the basket, one at a time, cover, and allow to steam for a few minutes, or until softened. Stir in the fresh parsley, spring onions and thai chilis into the chickpea filling before adding them into the tortillas. Serve immediately with the chilled avocado sour cream. All I need are tortillas and sour cream!!! All I need are tortillas and sour cream!! This sounds so very tasty – that's my dinner sorted! Yum! 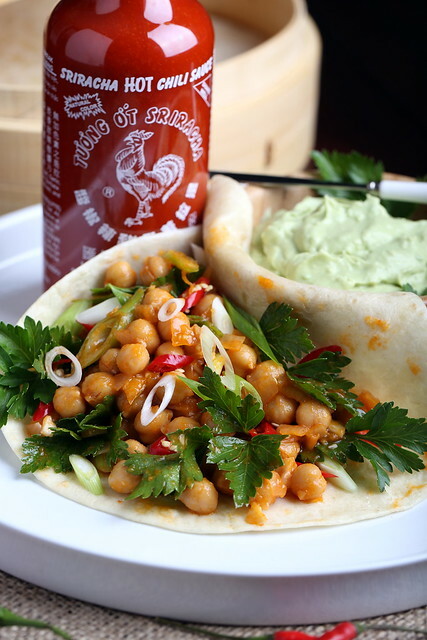 I love chickpeas in tacos, and anything with 1/4 c of Sriracha has to be good! Can't wait to give this a try. This is the kind of food I eat ALL the time. I will stuff anything into a tortilla but your buffalo chickpeas sound like a new favorite. I usually don't like the taste of Tofutti SC but bet it taste a lot better with an avocado mixed in! these look so perfect that they can't be real! 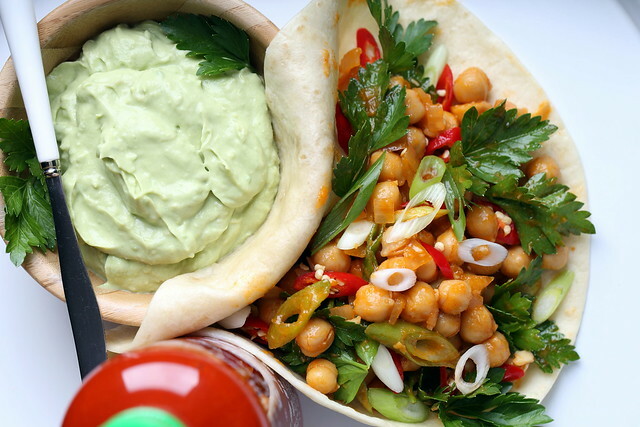 i LOVE chickpeas in tacos! who would have thunk to simmer chickpeas in Sriracha.. you..who else.. This is one awesomely perfect meal Erin. Wow, this is AWESOME! I don't have a crockpot, so I threw the things that would go in it into a medium-sized pot instead. (I also replaced the buttery spread with coconut oil.) I brought it to a simmer, then kept it at a simmer for about 20+ minutes, stirring every few minutes so the stuff wouldn't stick. I will definitely be making this again. I also used 3/4 cup dried beans and cooked them in my rice cooker, instead of canned beans. Yummy!!! I wish I had doubled the recipe and will do so next time. I'm not a vegan but I try to cook vegan/vegetarian often….your recipes look AMAZING. So looking forward to trying them out!!! These were absolutely amazing! I did a little tweaking, I used cilantro instead of parsley and I added 2 tbs of garlic. I didn't mash the avocado all the way, I sued a large avocado and left it chunky. But seriously this is now one of my favorite and easy dishes. Thank you so much for sharing this. Love love love it! So happy you enjoyed — and thanks for your very kind feedback! I love to hear that — thank you!